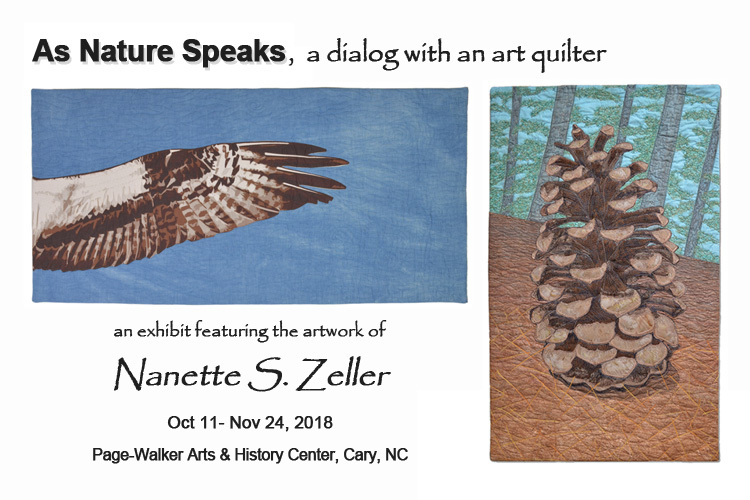 One of the great things about showin g my art at Page-Walker Arts & History Center in Cary, NC is the new group of people who will be able to see my work. This gallery space is frequently utilized for other events. They hold classes and meeting in the rooms and also rent out the space for special events….including weddings. Imagine having your wedding in an art gallery! How cool is that? The down-side for the couple is when they reserve the space, they really won’t know what will be hanging on the wall until the artwork is hung. This doesn’t give much time for creative coordination of the bridal party and reception. It’s possible that the walls could be filled with colors that clash with the colors of the bridal party. When I was hanging the show, I really wanted to see my artwork as part of a lively bridal reception, so I asked the director if she could get a photo for me. There will be several wedding events at Page-Walker while by art is hanging there. 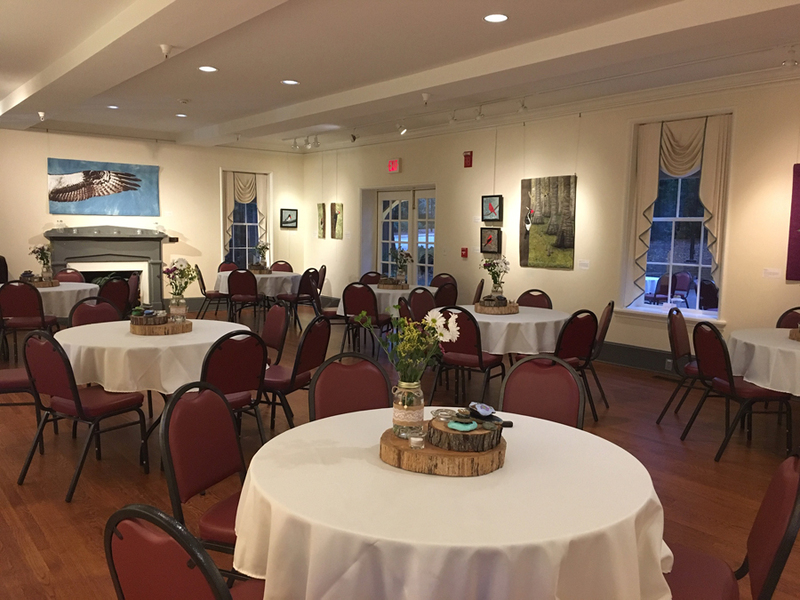 Last week, I received an email with a photo attached and was so happy to see the gallery all dressed-up for an upcoming reception. But, I looked closer at the photo and notice the centerpieces on the table. 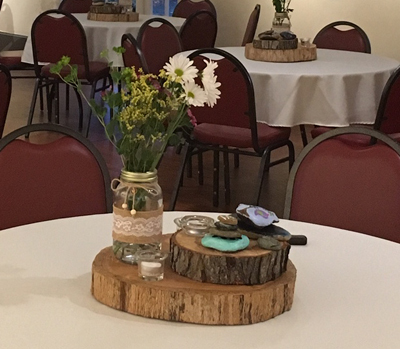 There on the center of each table is a stack of disks cut from tree trunks. On each stack are several stacked stones and a pretty mason jar with an arrangement of wildflowers. Little votive candles are also included to complete the elegant mood for the reception. The couple may have known that my artwork was going to have a nature inspiration, but surely they didn’t plan their reception around it. It’s so special for me to know that this couple, who clearly loves nature, will have a backdrop of nature-inspired art. It made me so happy to see this photo. It’s also so rewarding to know that, years to come, people will see my work in this couple’s wedding photos. I am overjoyed that they shared their special day with me.